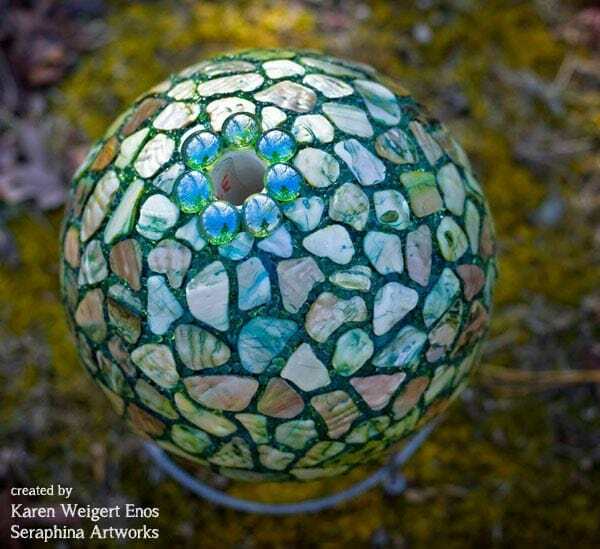 This gorgeous garden art gallery features the artistic works of Karen Weigert Enos of Seraphinas Artworks. 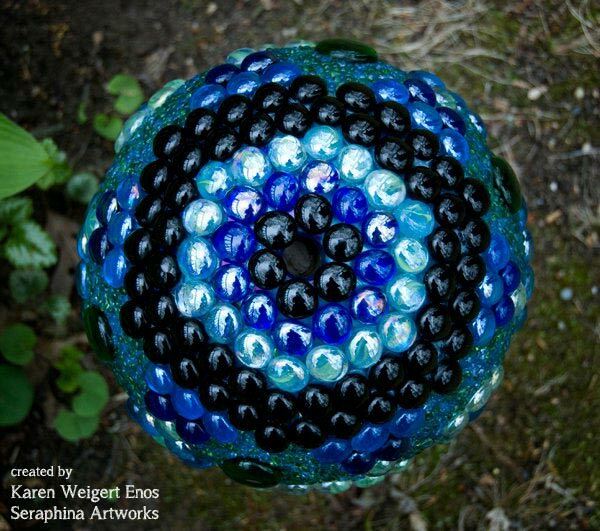 Karen makes these garden art balls using bowling balls, glass gems (flat marbles) and some extra touches you’ll see listed below. 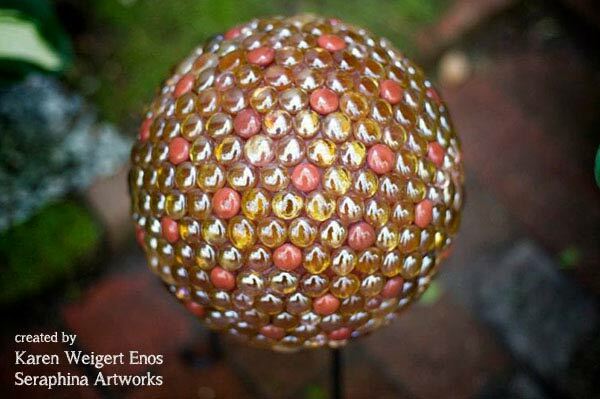 Come explore the gallery where Karen shares some basic tips for exquisite garden orb art-making. 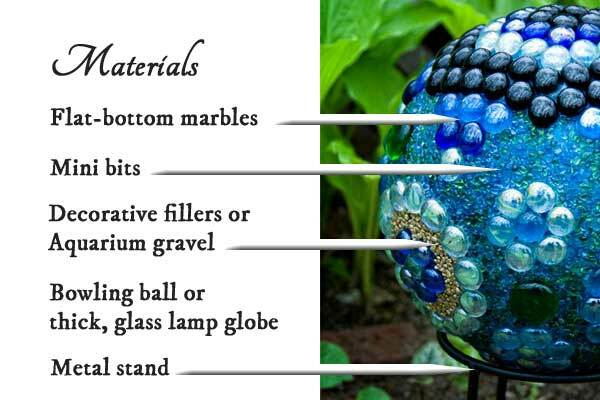 Also see, How to Make Garden Art Balls for instructions and recommended materials. I first saw Karen’s wonderful garden art when she dropped by the Empress of Dirt Facebook page and shared her latest work of art. And boy did she knock my socks off. 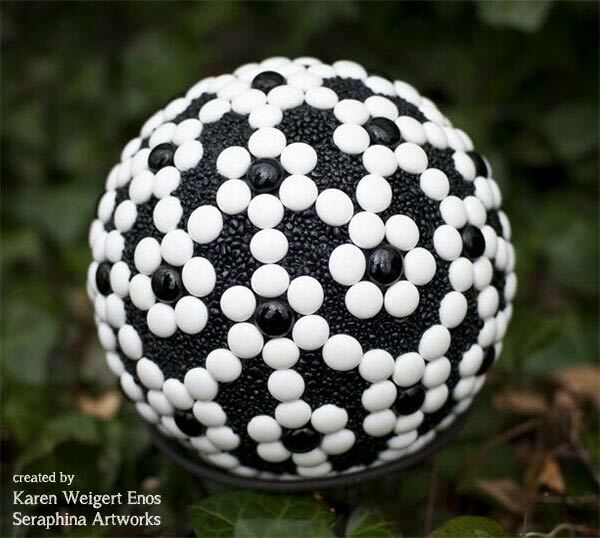 Not only are her garden balls beautiful, but I immediately noticed how meticulous she is with her work. I could see that she takes tremendous care (and time) to achieve this level of perfection. 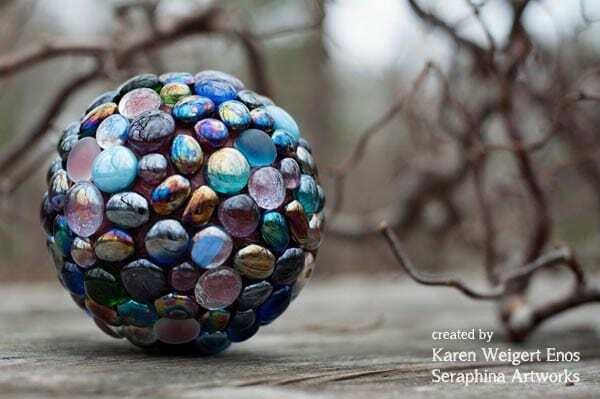 When readers see Karen’s work, they always ask the same questions so she’s kindly answered them (below) and best of all, you can buy these garden balls if you prefer. Creations: garden art balls, barrettes with recycled jewelry pieces, dish gardens, drawing pixies, elves, and aliens, painting, mosaics. 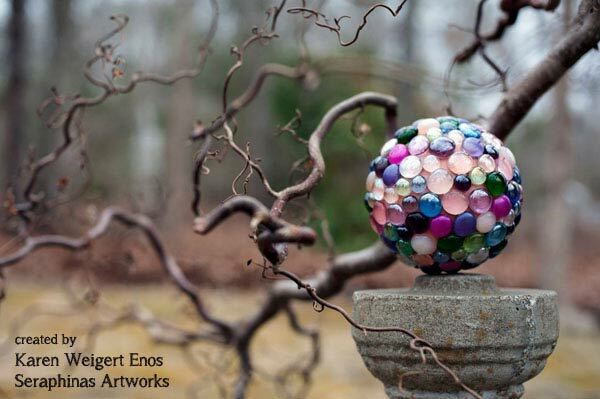 1 What supplies do you use for your garden art balls? Bowling balls – large and small (candle pin) bowling balls. 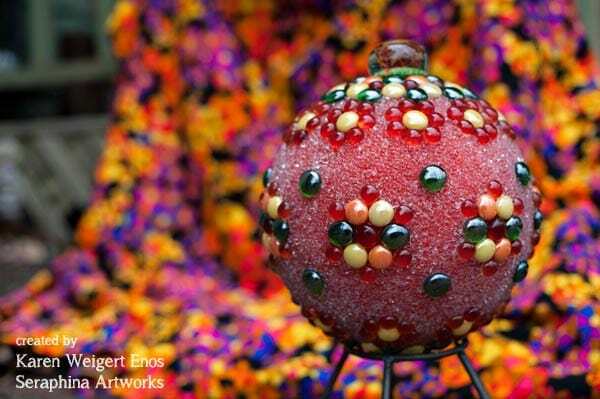 You can also use old, glass lamp globes. They have nice, thick glass and do not break. Marbles – flat-bottom marbles, round marbles (glass gems), square gems. Mini-bits (embellishment glass, 2-4 mm). You may also find them sold as vase fillers – see them here on Amazon. Be sure they are glass or plastic, not the ones that dissolve or inflate in water. Also, check the floral department of crafty supply stores for small plastic or glass pieces used to fill vases or terrariums. I have found several types in dollar stores. Decorative fillers (Ashland Co) pearlized shell-like pieces (pink, green, blue). Aquarium gravel (matte and shiny). Adhesive: GE II Silicone sealant. Please read this for tips to get the best result with this adhesive. tape measure, toothpicks, box cutter, Lazy Susan and stand, Windex or acetone, rags (clean up). 2 How long does it take to make them? The more complex balls can take 2-3 weeks and up to a month (at my pace) to complete because my technique requires more patience, time to design, decorate and cure. 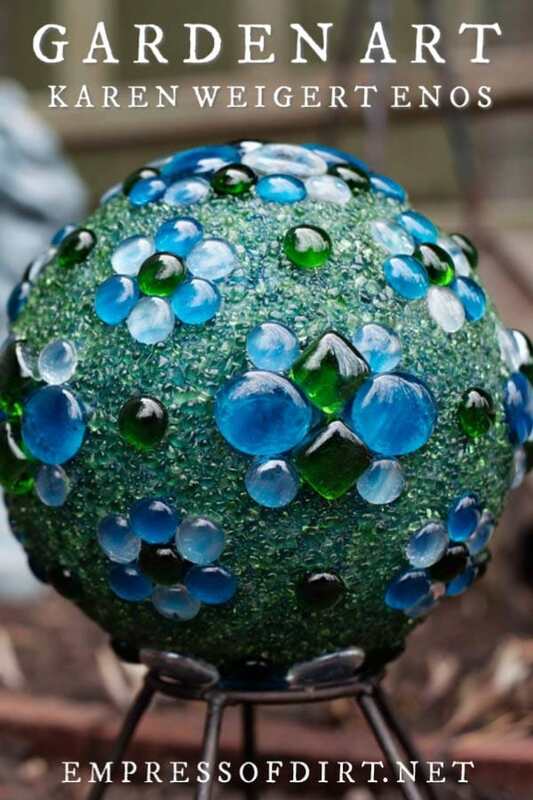 3 Any tips you would like to share for making garden balls? Clean off any dirt and wax from all bowling balls. Fill in finger holes with GE II Silicone Sealant. Leave thumb hole open for staking with rebar in the garden. Thumb hole can also be used on the top for adding unique objects. Measuring and marking your design first is very important because the gems can be irregular in size. 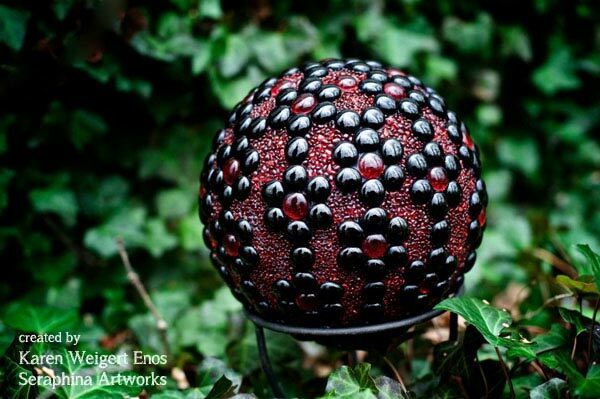 4 Do you sell your garden art balls? Yes. You can contact Karen through her webpage here. 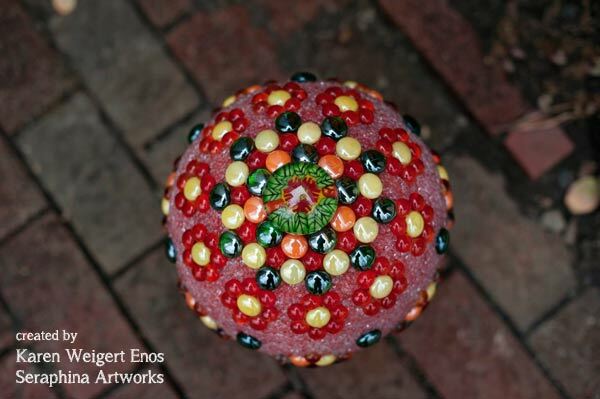 The photos you see here are by Karen Weigert Enos and Tina Marie Enos. 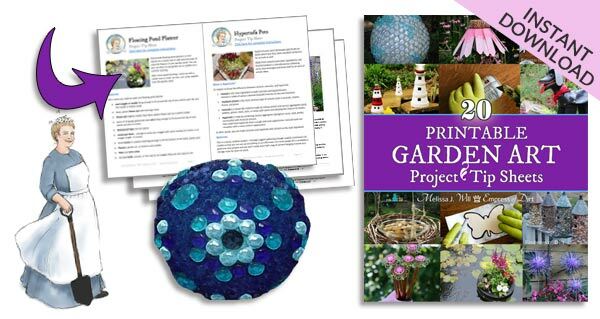 As you can tell from what Karen shared, these garden balls are not quick and easy projects. 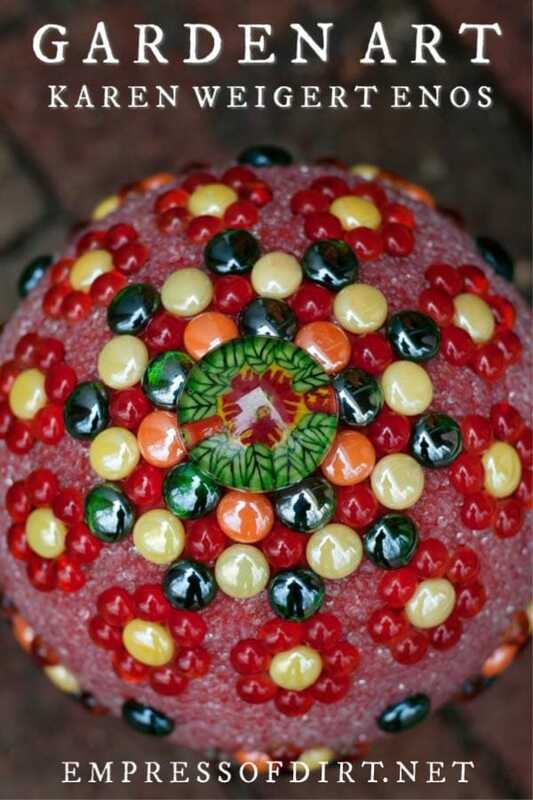 Karen takes time to ensure the surface colour of the bowling balls fits the colour theme of the decorations, and, on the more-detailed pieces, meticulously places mini-bits and decorative fillers between the larger marbles and gems. I really enjoy the range of colours and styles. 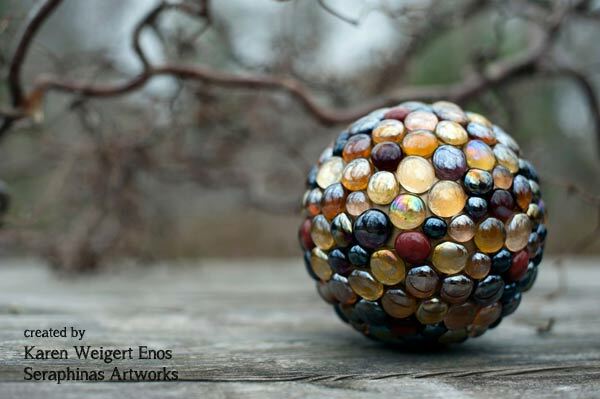 A design like this one takes carefully planning and measuring to be sure the main marbles fit perfectly. 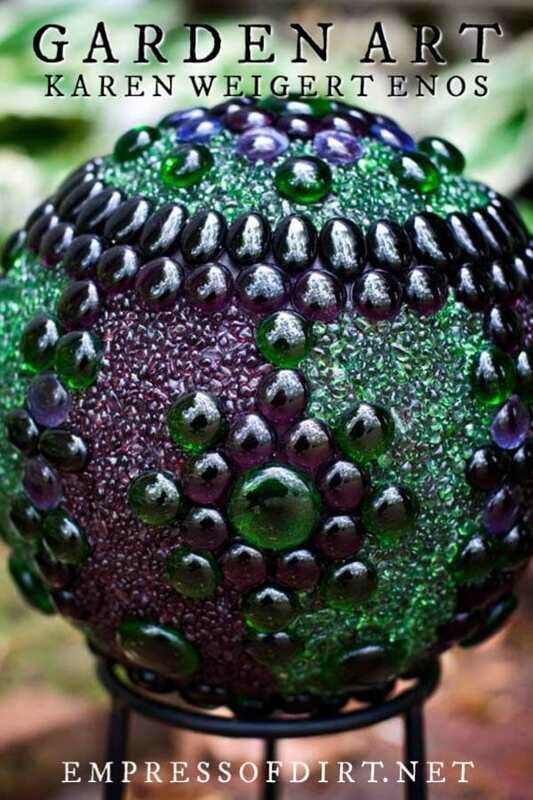 This purple and green ball is an example of one of the more detailed, time-consuming garden art balls. Notice how Karen has carefully placed mini-bits and fillers in all of the sections. It’s not a quick project but the final product is well worth it. Thank you to Karen for sharing your lovely art. I can’t wait to share this garden art with my neighbor. There is an empty spot between our houses that we have been trying to come up with ideas forever on how to make this area pretty. I’ll take before and after pictures but it may take a long, long, time. Hot glue not stand up for outside weather? Hi Carol, In my opinion, hot glue does not hold up at all outdoors. It is only useful for temporary adhesion or very lightweight indoor items. 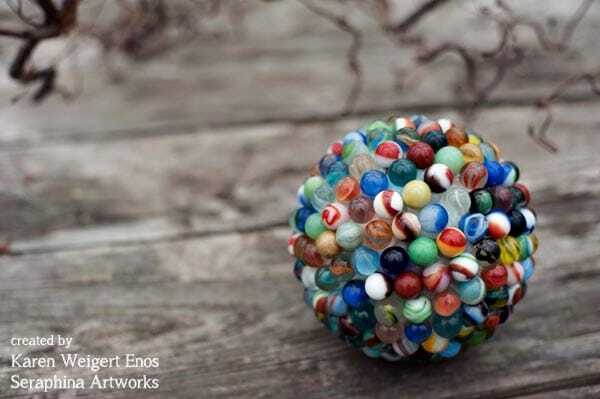 I’m wondering how you keep the round marbles from sliding down. I’ve read you can tape them but haven’t found a tape that works.any tips you can share? Your work is exquisite! 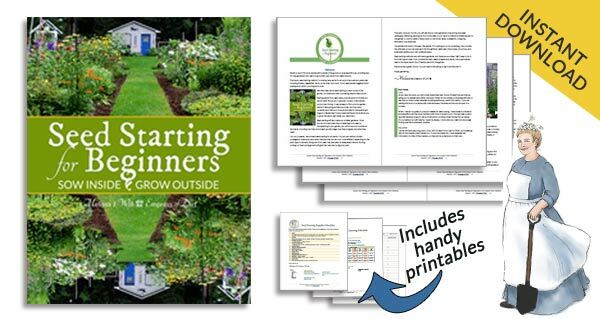 Hi Susan, Karen has said that the key is to work slowly covering only small areas at one time, giving the adhesive time to dry before moving on, instead of setting the main lines or designs first (as we tend to want to do). We haven’t found any sort of removable tape that offers a good solution to this. If I would decide to paint the bowling ball, what type of paint do you recommend? Hi Terry, I use all-purpose exterior spray paint with primer (all in one). Sand the ball, give a few coats allowing proper drying time, and sand again so stuff sticks nicely. I have my mom’s old bowling ball. She pasted years ago. Thank you for posting this. 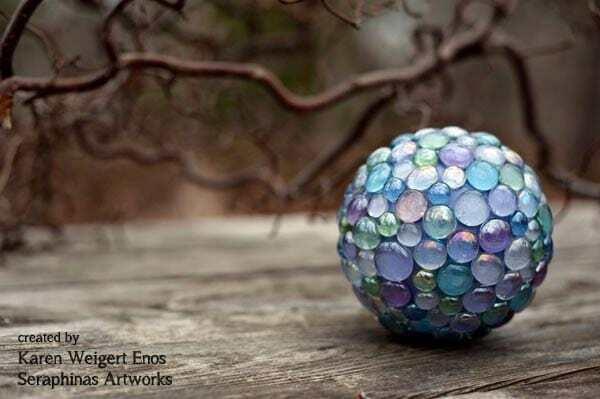 I am going to cover it with her favorite colors and place it in the yard. To me the most important question wasn’t aswered. Where do you get the bowling balls? Bowling alleys. 🙂 Some sell off old ones. Also try yard sales, thrift shops, online ads (place a wanted ad or answer one). HI, I was just wondering if using g sterophne ball would work the same. 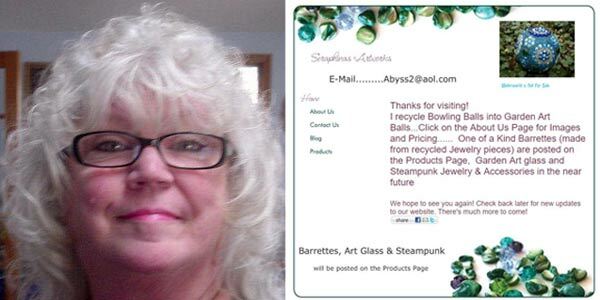 Hi Kathleen, No, styrofoam dissolves when the adhesive is applied and is not strong enough to endure weather conditions. Thank you, Karen really is very artistic,and lots of different way to decorate them. These are beautiful! 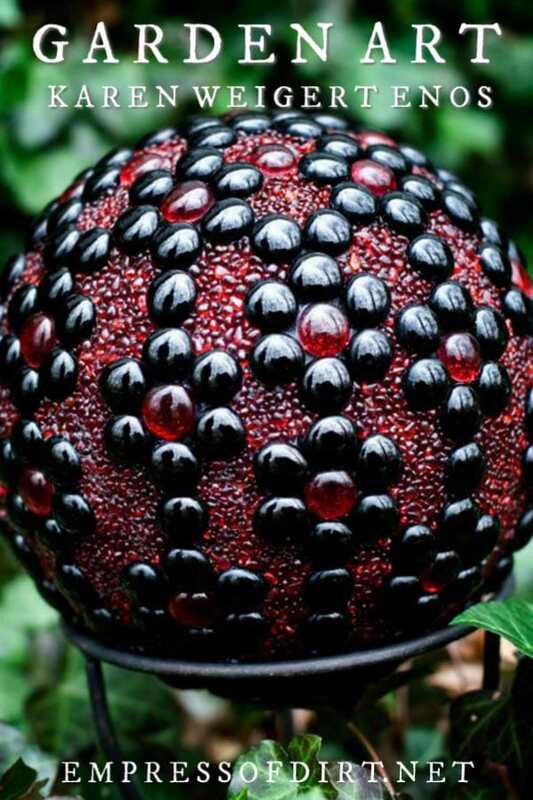 Can anyone think of something other than a bowling ball that can be used to make these? ? How do you clean the silicone off the glass marbles after it dries. Could you tell m what you are using to affix the glass stones to the bowling ball?Thank you. could u not use kids rubber balls??.. Hi Maggie, I know one person who uses old soccer balls but she lives in a climate where there isn’t much variation in the temperatures. I’m not sure if they would hold up with expansion and contraction from the seasons. Might work if just kept out in moderate weather. If you try it, please let me know how it goes. I never find cheap bowling balls so I use glass lamp globes from the thrift store. The older (thick) ones are very strong and work great. I’ve got some in my garden that have endured over 12 winters now. Sometime the thrift stores aka Goodwill stores will have them. I “befriended” the manager at the local bowling alley and he found used balls for me. Some had a crack but since I intend to cover it with glass beads it did not matter. Very good! I hear many of them just go to the landfills when they’re no longer useful at the bowling alley, so great to put them to use. I got mine from the bowling place near me. Just went in and asked if they had chipped balls they no longer used. They gave me five. Oh my gosh, I have to make one. What a great idea! These are so pretty. Must make one for my garden.